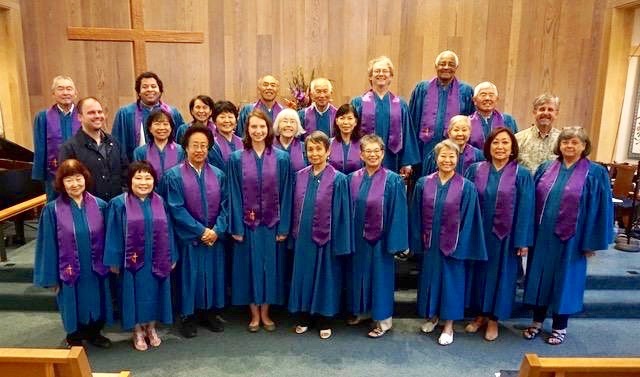 The Nichigo (Japanese Language) Choir performs at the 10:00 AM Nichigo worship services on the 2nd and 4th Sundays of each month and on special occasions. Practices are held on the 1st and 3rd Sundays from 11:30 AM - 1:00 PM in the Nichigo chapel. We have many dedicated members who really enjoy singing for God. It is a very casual and fun group. Please come and join us! Aloha! The Wesley Ukulele Band performs at our church's Aki Matsuri, Worship Services, Yu Ai Kai and Wesley Missions Luau Dinner, picnic, anniversary parties, JACL events and at the Grand Opening of Japantown's Ukulele Source! We'd love to have you join us for music, fellowship and fun! We meet the second Sunday of every month at 1:00pm. Please check the monthly calendar for any date changes. The Wesley Praise Band performs during the Sunday worship service. They play sacred music ranging from traditional hymns to modern Praise songs. The Wesley Jazz Ensemble ("WJE") has evolved from the original Wesley Boy Scout Band which was started in 1996 by Wayne Adachi (then Scoutmaster for Troop 201). Over the years, the band's makeup has changed. The band has eighteen members, consisting of 7 horns, a full rhythm section and vocalists. WJE has continued to perform at various community events (i.e., Nikkei Matsuri, Japantown Vibe Festival, Yu-Ai Kai, Sacred Heart Community Center), church related functions (including Aki Matsuri), and senior citizens/nursing centers throughout the San Jose and Mid-Peninsula areas. WJE's music encompasses a variety of songs from the swing-era of the 40's, jazz standards, blues, Latin tunes, rock and roll to today's well known popular hits, as we feature solos from all members. Our shows and performances have included surprise "wanna-be's" and impersonations of famous singers and vocal groups.